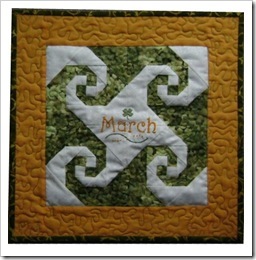 The March calendar block is based on a traditional quilt pattern called “Snails Trails.” It was made using paper piecing, which is an easy way to get perfect blocks. 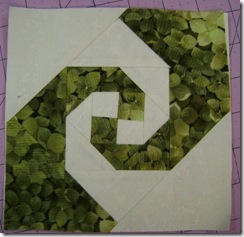 If you haven’t done paper piecing before, this is actually a good block to begin with, as it only utilizes triangles! I was going to do a tutorial on paper piecing, but found an excellent one by Marcia Hahn at Quilter’s Cache. Why reinvent the wheel when she has done such a nice job? The block is done in the colors of the Irish flag, in celebration of St. Patrick’s Day. There are some great green prints out there to choose from… I loved this one which kind of resembles a four leaf clover if you scrunch your eyes up. See what you can find! I had some left over white-on-white fabric from my January block, so that worked for me. Please don’t forget to post pictures of your blocks for the rest of us to see… and let us know where to find them!